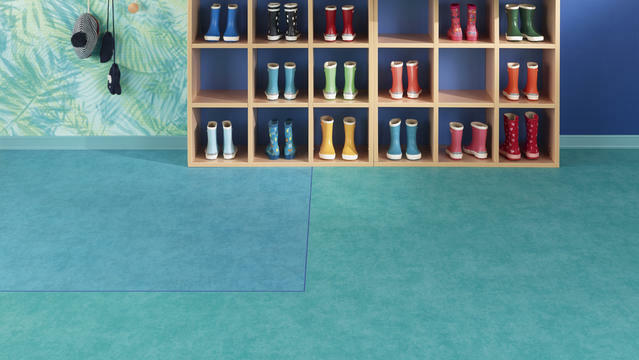 Tapiflex Platinium is a high-end acoustic and extremely durable heterogeneous vinyl floor for commercial use. The collection strikes a unique balance between acoustic properties (17dB sound reduction) and indentation properties (0.07mm) for improved rolling capability. Thanks to its inlaid manufacturing process, including the generous opaque wear layer of 1,02 mm on all references, the design has depth and remains extremely stable over time. It is treated with our trademarked Top Clean XP surface protection for extreme durability and cost-effective maintenance. Also available in compact format with Acczent Platinium, this collection is part of a fully-integrated solution including wall coverings, wetroom options and accessories. And it's 100% phthalate free.